The 1970s and 2010s are not the same but there can be no doubt that they are both periods of social crisis that has carried over in to art. This installation frames the beginning and end of a process for me in the 1970s. I’m sure many others went through their own version of this process where the radicalisation and distrust generated by the Vietnam War produced a critique of all institutions and a questioning of business as usual. The even worse crises of the 2010s are being driven by looming climate catastrophe and the triumph of neoliberalism, increasingly recognisable as a form of fascism. In that context this exhibition’s question, “how can art distinguish itself as a space distinctly separate from capitalism whilst also sharing its conditions?” is asking the wrong question, at least in terms of my work if not others. The problem is that I don’t believe art really exists as anything other than a capitalist product category so indeed how can it distinguish itself as a distinctly separate space? The answer is it can’t. While cultural activity in the broadest sense is as unavoidable a human activity as falling in love, making art is not, it begins with the industrial revolution and it probably lost most of its significance after the 1970s. 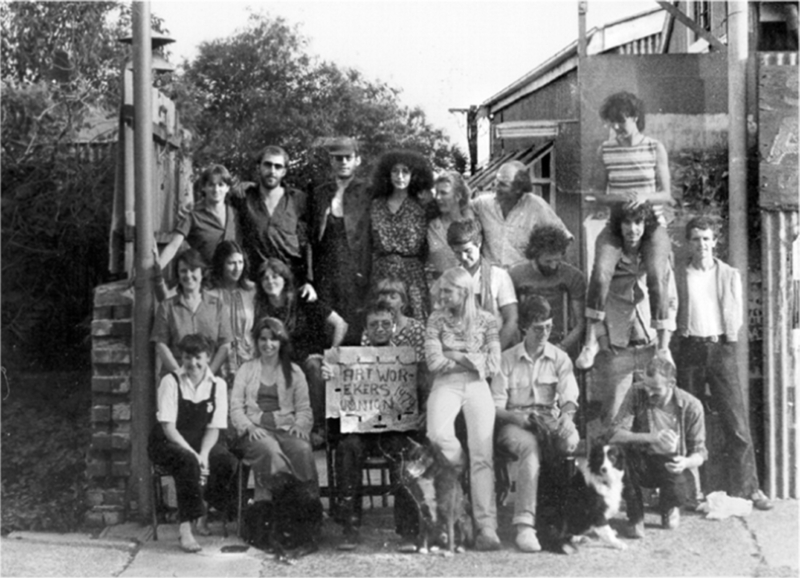 The time between Life In One Room (1971) and the formation of the Artworkers Union (1980) was the most active period in Australian history of artists’ resistance to institutional co-option. It saw attempts to create some degree of “worker control” in the visual arts that in retrospect can be viewed as a sort of untheorised autonomism but the immediate issues at the time were control and equal participation rather than remuneration. Remuneration was always lurking in the background but the fact that the crisis in art can now be framed as an issue of remuneration indicates the extent that neoliberal thought has infiltrated every last aspect of our lives. I can summarise fairly quickly my personal wanderings in the 1970s. By my twentieth birthday, in 1970, I already knew I would probably never make any money from my art activities. Already I wasn’t producing an object that could be sold, only site specific installations or expendable props. After being a bit depressed I decided it actually gave me freedom, that I could push much further if I didn’t have to limit myself to conventional marketable forms. While other artists of my generation monetised by selling documentation – the “paintings” you sell when you don’t have paintings – or even regressed to real paintings, etchings even, I was free to use any media no matter how ephemeral or apparently beyond the pale in art world terms. By the time I produced Life In One Room, which turned out to be the last work I would exhibit for nearly twenty years, I was thinking hard about what defined art and its ideological role dressing up the crudity and violence of wealth. 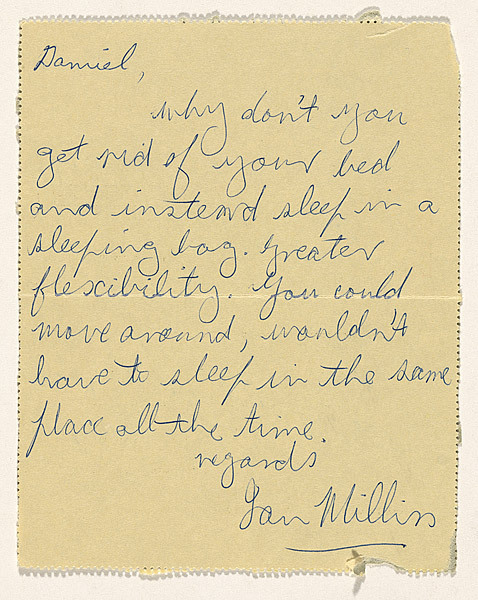 In 1971 I was also writing to friends suggesting changes in their living arrangements. At first I took a cue from the New York Art Workers coalition. I was on the committee of the Contemporary Art Society (CAS), the only artists representative organisation of the time and an editor of its Broadsheet which I used to distribute the Art Workers Coalition artists contract, developed to regularise artist-gallery relationships. Tellingly neither artists or galleries were very enthusiastic. But I saw this as using the art world infrastructure as a potential art medium. I filled the Broadsheet with a wide range of pirated articles and document from Guerrilla Art Action group writings to Henri Lefebvre essays to Sydney City Council minutes discussing inner city development issues, not the normal art magazine content of the time but surprisingly like my current amateur aggregator and publisher activities on social media. With the first green bans in 1971-72 I realised the builders Labourers federation (BLF) were doing for real what I was only toying with, minimal interventions in urban and social spaces that had far reaching consequences. I developed connections with them that became more urgent when the Victoria Street Kings Cross area where I lived was threatened by developers. I spent the next several years working in resident action groups then the anti-prison movement that grew out of it based on the prison experiences of various activist friends. 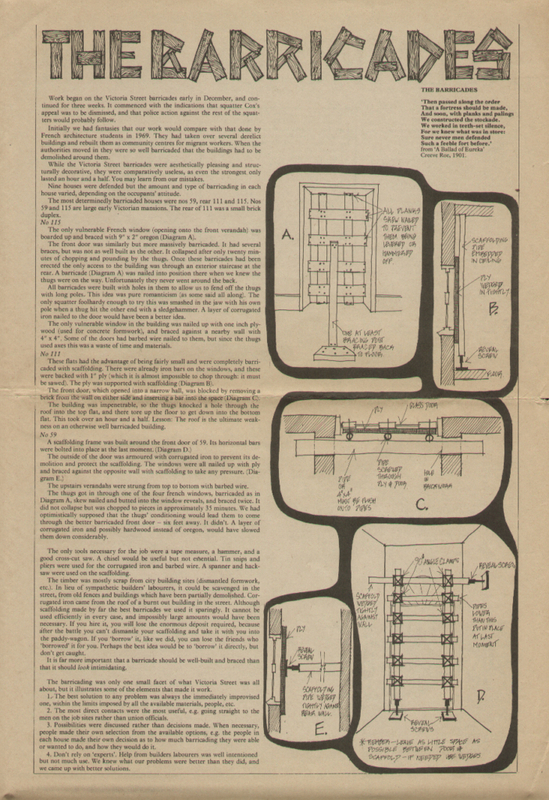 I regarded this 1974 article on how to barricade a squat as my next significant art work following Life In One Room. At the same time I maintained an art world presence working on the series of actions that developed around the Biennale of Sydney. These protests were focused on two specific demands about the Biennale content: equal representation of women and equal representation of Australian artists. 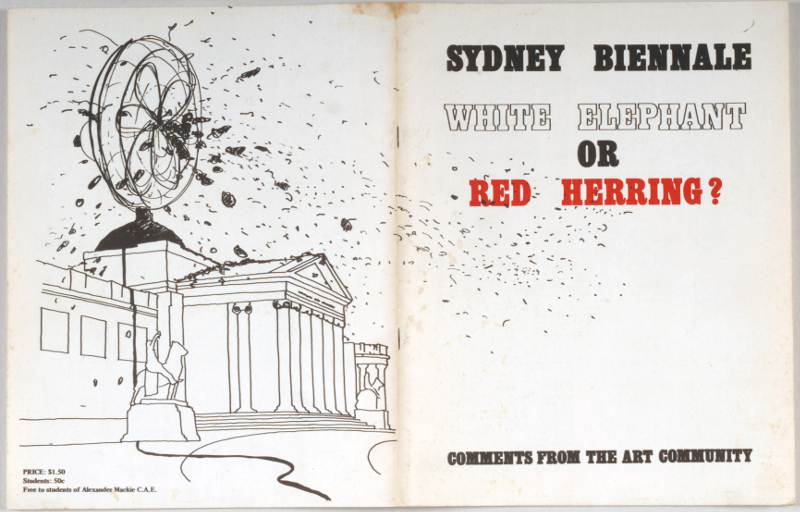 The 1979 protest included an open sourced publication, White Elephant or Red Herring, of artist responses to the Biennale. It included an article by myself and Ian Burn, Don’t moan, organise! that first proposed creating an artists union. Over the next year with many meetings and a lot of work by several hundred artists we set it up. Artists open sourcing in 1979. I also had other projects during this period that are now acceptable art projects but weren’t all acceptable then. My Yeomans Project about radical agriculturalist PA Yeomans, was scheduled for 1976 at the Art Gallery of NSW. It was cancelled by the Trustees on the grounds it was not art but eventually took place there in 2013, thirty eight years later. A related project developing a nursery and vegetable gardens devoted to edible native plants never got past its early research and collection phase after I was injured in an anti uranium mining action. The Media Action Group, a largely academic collaborative project producing slide shows analysing media treatment of various political issues led eventually to the formation of Union Media Services. And The Hunter Valley Project, a series of exhibitions initiated by art dealer Frank Watters, investigated community reactions to the expansion of coal mining in Hunter Valley, becoming one of the most celebrated early successes of the rapidly developing community arts sector. 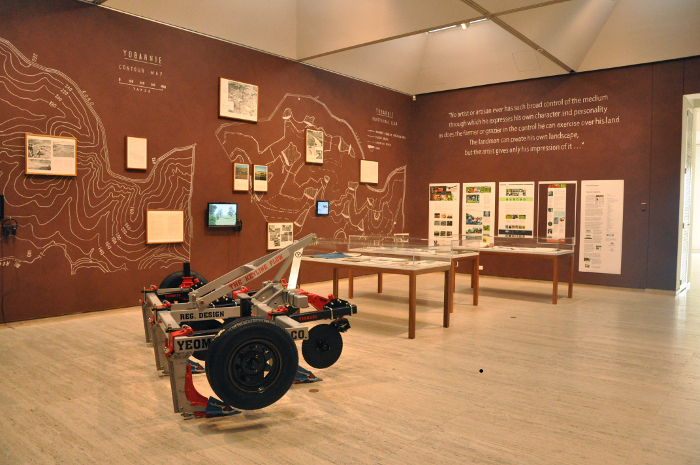 The Yeomans Project finally happened at the Art Gallery of NSW in 2013, thirty eight years after it was originally scheduled and as a collaboration with Lucas Ihlein. On many occasions, however, it was made quite clear to me that I was officially regarded as having given up art , a failed artist who was a classic case of great potential and early success followed by premature crash and burn. At the core of that judgement was remuneration. I had not built up a cadre of collectors whose investment in my collectables would have bought cultural capital for me and more importantly, for them. The transubstantiation of crude financial capital into magical cultural capital is the secret ceremony at the core of the artist/dealer/collector/institutional relationship. And the reason was simple, no matter how significant and influential my activities might be they did not generate easily trade-able and exhibitable artifacts. Essentially art was a business model, not a cultural model. The isolation I described in Life In One Room was gone, replaced by collaborative working processes with groups and large organisations. The individualistic artist-as-hero cult no longer had any meaning for me, I was an embedded and almost anonymous person using art skills to further socio-cultural objectives. Union Media Services, the organisation several of us had created was paid for its trade union campaigning work but our work was not collectible in an art world sense, unlike the screen printed posters made by other groups. Our “art work”, if it could be called that, was creating a new form of campaign organisation within the trade union movement. The Artworkers Union itself became my last action in the conventional art world for at least ten years until I began to occasionally exhibit again during the 1990s. It was only when I began to find congenial collaborators like Lucas Ihlein and the Squatspace and BigFag group that exhibiting again became a regular but small part of my broader cultural practice.